Please join us as we share the worlds of FEAST and FLIGHT with a gathering of artists, musicians, dancers, designers, inventors. This screening doubles as a meeting of all those involved or those are interested in becoming involved in this ongoing project. 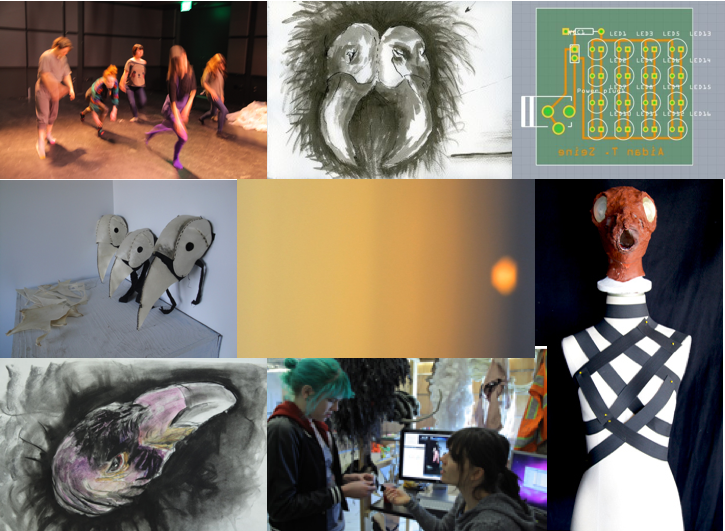 The gathering takes place during Open Studios in the Dark Lab in the DARC building at 1:00 on Friday, March 15. FEAST and FLIGHT are the fourth and fifth films of the experimental film series, SEEKAGO directed by eveWarnock. FEAST and FLIGHT explore social eating behaviors through mimicking the movement of scavenger birds. The films incorporate, movement, sound, costume, puppetry, projection, electronics, and animation. Any artist that participates will improve artist portfolios, experience new mediums by collaborating with other artists, gain first hand experience in creating a professional video production, and earn DANM credit. Acting: Actors will be responsible for performing in both FEAST and FLIGHT shooting dates, as well as our weekly team meetings and rehearsals. Actors will get a chance to be vultures, ravens, owls,or magpies. The performance is movement based, with vocals, and some puppetry. Costume Design: Designers will be responsible for attending weekly meetings, as well as coming in at least twice a week to work on costume production. The costume designs are a collaborative effort between the designers, however each designer is responsible for mocks up of original ideas. You will be working with fabric and sewing machines, so any prior experience working with these materials would be preferred. We are also working with latex, electronics, resins, mold-making, mechanisms and puppetry. Camera Crew: The camera crew will be responsible for attending our weekly team meetings, as well as working in the DARC building with film production. Responsibilities include shot design, going out to film sites, documentation of process, and creating media for projection and animation. Film Editing: Editors will be required to attend our weekly scheduled meetings. You will primarily be working the video editing software Final Cut Pro and editing sound, graphics, and projection media. Prior knowledge of film editing software is preferred for this position. Stage Management: Stage Managers will be responsible for attending our weekly team meetings, as well as a separate individual weekly meeting with the director. This position requires great organizational skills and excellent communication skills. Responsibilities include setting up meetings between areas of production. You will be responsible for creating teams to assemble and and tear down sets, scheduling meetings, and the communication between the different areas of production. Organizational and communication skills needed. Animator and Film: Media Artists will be responsible for collecting media for projection as well as working with the editor in creating animation to help in the storytelling. For this position an understanding of animation software or technique is necessary. We will be meeting once weekly. Assistant Director: The assistant director will be working side by side with the director, handling most email communication. He she will also act as an adviser in the performance helping to delegate responsibilities. Efficiency and self management is a must. They will be attending all meetings. Tech crew: Looking for lighting designers, stage hands, and anyone who wants to get involved in the behind the scenes activity. We will be meeting once weekly. Sound Artists: The sound artists are responsible for collecting sound samples, and constructing soundscapes. We will be meeting once weekly. You will need the signature of a faculty sponsor. The adviser and chair signatures will be signed by the DANM MFA Program. Please bring form with faculty sponsor signature to March 15th meeting.